Maalaea is a tiny port town that serves the South Shore, but it’s growing. Harbor improvements, and destinations like the Maui Ocean Center, the Maui Golf and Sports Park and the Maalaea Harbor Shops are part of the area’s life blood. One of the newest additions to the Maalaea dining scene is Porto (“port” in Italian). Porto takes up the old Juca spot, which has been vacant for around a year or so. The restaurant is the beginning of a food and drink venture by Pacific Whale Foundation, which hopes to use Porto to support their other boating and retail operations. So far no restaurant had been successful there, but in order for PWF to get the lease there had to be a front of the house operation for the shopping center. They did some market research and found that Maalaea needed pizza. 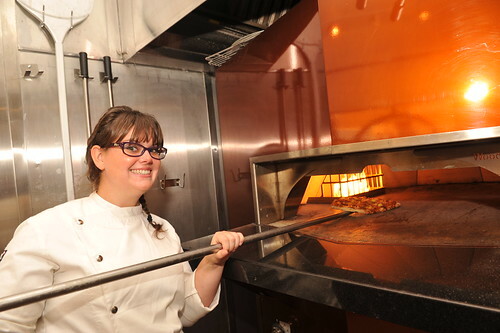 Oregonian Chef Meagan Kilgore was hired in May of 2011 to form the teams that head their Ola Catering operation and Porto, but she was already familiar with Maui, having done her formal training at the Maui Culinary Academy straight out of high school. After graduating, she headed back to the mainland and did some time as a chef at Nike World Headquarters, a country club and a beer and wine pub, but couldn’t resist the opportunity to return to Maui. Their artisan flame fired pizzas are the shining glory of their menu. Kilgore says they use authentic semolina flour ground in an Oahu mill and make everything from the focaccia to the breadcrumbs in their meatballs from scratch. She told me she tweaked the pizza dough recipe 22 times to get it to the perfect crispy-on-the-bottom-but-still-chewy consistency she wanted. 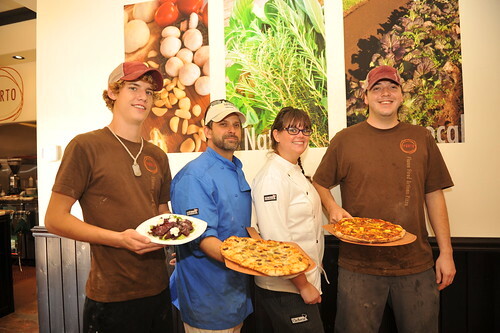 Their handmade pomodoro sauce is created with organic tomatoes, which provide the best flavor. Kilgore says she chooses local organic farmed goods as much as she can. The pies are hand-shaped and served on a big wood paddle. The Kalua Pig and Pineapple is a twist on the ham and pineapple staple, but it works better that its predecessor. Kilgore uses Duroc pork shoulder, rubs it with her special blend of spices and then roasts it overnight with herbed sachets, using the residual heat of their copper clad Woodstone open fire oven, which saves energy. 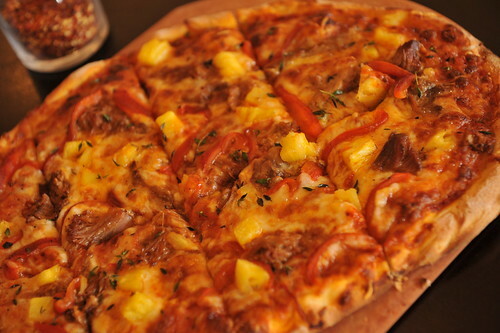 The fresh Maui pineapples have a bright juicy acidity that balances nicely with the rich roasted pork doused with cheese. The sprinkling of fresh herbs on top brings the whole pizza together. The Olivia pizza is glazed with garlic béchamel before it’s blanketed with mozzarella and parmesan and sprinkled with briny kalamata and green olives. This pie was reminiscent of my love for anchovy pizza: it had that salty/briny payoff, but delivered in a more elegant fashion. The salads are a testament to the fresh organic bounty of produce, though their fire oven makes it hard to avoid choosing something roasted. The beet salad is the perfect compromise with roasted beets resting on Kula greens and then dribbled with an exquisite citrus oil and gourmet goat cheese. Kilgore is a trained pastry chef and the dessert menu reflects her love for fine baked goods. Housemade Kula strawberry shortcake, Tiramisu cupcake and Italian meringue and fruits are a find on the back of the menu. Porto also offers bruschetta, antipasti, panini and soup. To round out Italian eating traditions, they serve Maui Oma roasted coffee, fine espresso and cappuccino.